Little break from North India Trip Blog, this time we tried something different. It was visit to 35th Annual Niligiris Cake exhibition and International Life style exhibition. We went to exhibition at St. Joseph College, Vittal Mallya road, Bangalore in the afternoon. The exhibition is from 18th December to 27th December 2009. The entry fee is Rs. 40 per head and children below 5 years free. 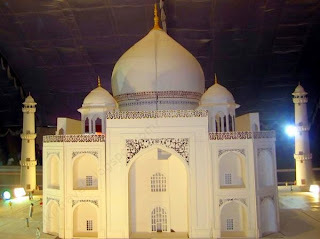 The star attraction in cake exhibition are 22ft Taj Mahal and 40ft Battle ship which are displayed at the entrance. 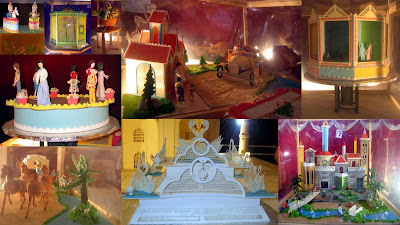 There are other 10 creative cake models being displayed such as Aquarium, Cowboy caravan, Rotating Show Window, Fancy Dress Parade, Birds in Cage, Castle, Fruit & Flower Basket, Santa in Vintage Car, Dummy Horse and Filigree Ornamental. Along with these, plumcake covered in almond paste are also displayed next to the models. Initially we had a feeling that the table (fruit basket & table as seen in the image) were made of wood. When enquired, one of the staff said it was not wood and was made of sugar paste with icing on it to give a creative effect. Then there are regular lifestyle displays. In cake exhibition we had different type of snacks and cool drinks except for cake hahaha.... This was welcome break from regular work. Cake exhibition has been extended till 31st December 2009.